Anthrax will headline the last metal show ever to play the iconic Sunset Strip House Of Blues in West Hollywood before it shuts down on August 7 to make way for a new hotel/housing/retail complex. 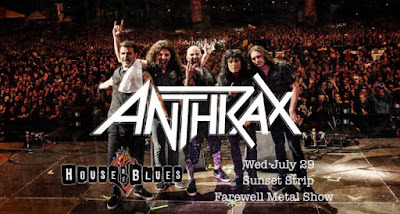 Anthrax bassist Frank Bello said: "Every show we've done at the Sunset House of Blues has been a party. Everyone who we're friends with who's not on tour shows up, either to jam or drink or just hang out. And I'll really miss that. Sunset Boulevard has lost its last great place to play." Drummer Charlie Benante added: "The memories that have been created will always live on for anyone who went to the House Of Blues. I feel honored and privileged to have this last chance to blow the roof off of the House Of Blues. The Strip will soon end up looking like a corporate strip mall, no memories there."